The son of an orthodontist, Dr. Kim grew up in New York City and developed an interest in dentistry at an early age. He graduated from the University of Maryland Dental School in 1991 and later completed an Advanced Education in General Dentistry residency at the University of Connecticut School of Dental Medicine. It was during his residency that he met his wife Gail, who also works in the office as a hygienist and part-time periodontist. They moved to Austin in 1993. Dr. Kim's personal interests vary tremendously. He enjoys cooking, tennis, skiing, hiking, golf, surfing, working with metal/welding, and painting in oils and watercolors. Dr. Kim, Gail, and their son Evan love living in Austin and exploring everything this beautiful city has to offer. 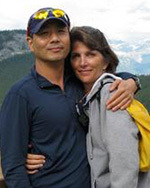 Drs Gail Nicosia and James Kim are a team in and out of the office. They met in 1992 in Hartford, Ct during a one year general dentistry residency program. They spent the following 2 years in Birmingham, Alabama where Dr Gail completed a specialty residency in Periodontics. The couple then moved to Austin in 1994. 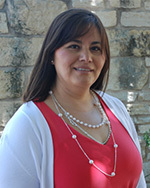 Dr Gail ran her own practice in central Austin until 2010 when she sold the practice to spend more time with the family. She currently works part time in Dr James office and is available to see patients for their periodontal needs. The Nicosia-Kim Clan has a third member, 17 year old son Evan, who enjoys tennis and robotics at Anderson High School. The family enjoys tennis and beach vacations and, of course, a really good meal! Dr. Kim & Dr. Nicosia look forward to meeting you and your family! If it is true that behind every successful man, there is a strong, wise and hard-working, then Maria is that woman for our office. Maria has been mastering/at the helm of	the front desk since the doors opened in 1999. Not only is she kind and thoughtful, she is endlessly skilled and ever dedicated to our patients needs. You can “hear” her smile over the phone. Maria spends most of her free time on the baseball field watching her youngest son catch. Otherwise she devotes her time to her husband, older son and her very large extended family here in Austin. Schedule an appointment with James Kim Dental today!